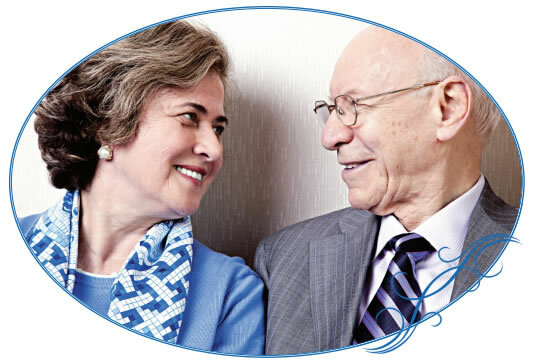 Rabbi Yitzchak Schochet reflects on how to keep a marriage alive. Rodney Dangerfield once said: “My wife and I had 25 wonderful years — then we met.” One of the great challenges of married life is the notion that familiarity breeds contempt. While things may be bliss at the outset, the routine engenders boredom, listlessness and eventually indifference. And we all know where that leads, as demonstrated by national statistics. The first of the seven marital blessings recited under the chupah is, “All is created for His glory”. Neither the bride nor groom is referenced in this blessing. What this suggests is that the very glue that maintains the vibrancy of every relationship is the awareness that G-d is very much a partner in the marital home. It is precisely the spiritual dynamic which makes every union far greater than the sum of its parts. Intimacy in marriage is among the most potent forces in life that can either lift us to the greatest heights of commitment or lower us into the depths “schedule time for romance”. But Judaism always promoted a divine plan of quality control in marriage, which takes proactive measures to prevent boredom from eating away at a good relationship. The question is: is there anything more beautiful in life than a boy and a girl clasping clean hands and pure hearts in the path of marriage? Can there be anything more beautiful than young love? The answer is yes. It is the spectacle of an old man and old woman finishing their journey together on that same path. Their hands are gnarled, but still clasped; their faces seamed, but still radiant; their hearts are of demoralisation. Intimacy is a fire. When you think you will quench it by indulging it, you quickly realise that you are pouring petrol, not water, on the fire. However when experienced with discipline, within the context of a blessed union, it becomes a fire that warms both partners and illuminates their lives. Thus we have the laws of family purity. Purity should not be confused with cleanliness, as it reflects a spiritual state. The laws of family purity bring that added spiritual dynamic into the marriage while also requiring a period of abstention each month, necessitating the relationship to be nurtured on other levels. It also then enables a rejuvenation of the intimacy each month as well. While the mikvah was once perceived by leading therapists as anachronistic, over time many came to acknowledge the practical reality of how it sustains relationships. Today, couples in crisis are advised to “schedule time for romance”. But Judaism always promoted a divine plan of quality control in marriage, which takes proactive measures to prevent boredom from eating away at a good relationship. The question is: is there anything more beautiful in life than a boy and a girl clasping clean hands and pure hearts in the path of marriage? Can there be anything more beautiful than young love? The answer is yes. Can there be anything more beautiful than young love? The answer is yes. It is the spectacle of an old man and old woman finishing their journey together on that same path. Their hands are gnarled, but still clasped; their faces seamed, but still radiant; their hearts aretired but still strong with love and devotion for one another. The one thing more beautiful than young love is old love. That is achieved most rewardingly and gratifyingly in the quest to harmonise body and soul through the deeper connection engendered by the mikvah and its associated laws as all those who experience it can readily attest to. The term soul-mate is not a cliché. It is precisely what husband and wife strive to become as their love is infused with G-dliness, whereby a mortal kiss is transformed into an immortal one, and they experience true joy and lasting fulfilment in their lives. Is it Me or is it Hot in Here? You can access My Calendar a revolutionary calendar to help keep family purity.